Einstein could have received 2 Nobel prizes. One for the photoelectric effect and another for the theory of relativity. Einstein was first nominated for the Nobel Prize in 1910 by the chemistry laureate Wilhelm Ostwald. In the next 10 years, his nomination gained support from theorists but the Nobel committee was not convinced. 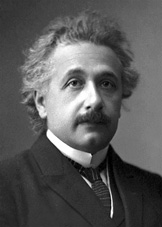 After Eddington’s 1919 eclipse observations confirmed parts of Einstein’s theory of relativity his nomination gained many supporters among the well known physicists of Europe. His new fame, however, created a backlash in the Nobel committee. They delayed their decision until the eclipse measurements in 1922 confirmed the predictions of the theory without any doubt. Einstein did not attend the Nobel ceremony because he was traveling in Japan and Asia. He actually received a hint from the chairman of the Nobel committee in September 1922 but he refused to cancel his trip to Asia. The presentation speech of the 1921 Nobel Prize in physics was delivered by Professor S. Arrhenius, Chairman of the Nobel Committee for Physics of the Royal Swedish Academy of Sciences, on December 10, 1922. The formal Nobel lecture was delivered by Einstein to the Nordic Assembly of Naturalists at Gothenburg on July 11, 1923. The lecture was titled Fundamental ideas and problems of the theory of relativity . The lecture did not mention the photoelectric effect that he won the Nobel prize for. The winner of the 1922 Nobel Prize in physics was Niels Bohr. I sometimes think that the whole situation was a bit unfair to Niels Bohr. He won the most prestigious award in physics in 1922 but his thunder was stolen by Einstein that year. This entry was posted in history, physics and tagged Albert Einstein, history, physics, science. Bookmark the permalink.